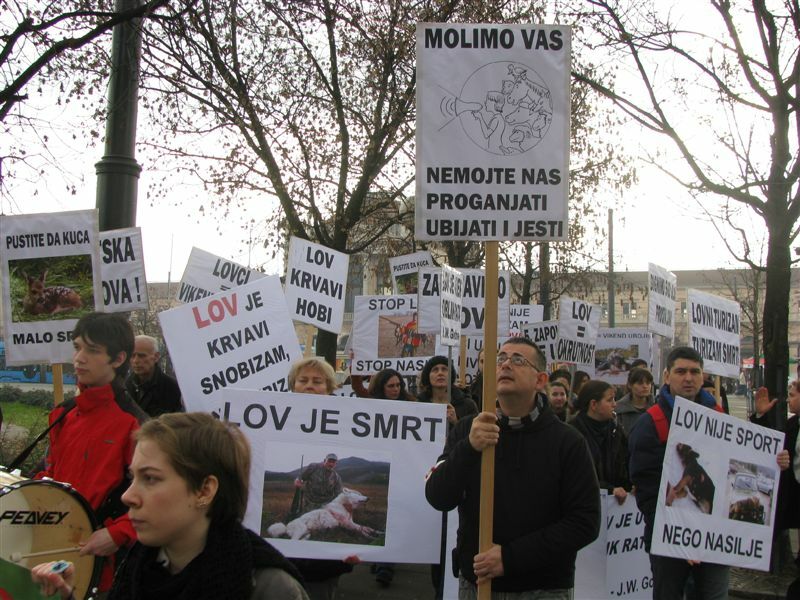 12/03/11 "Killing off" is Murder, Not Caring for Animals! Although civilized people agree that shooting and killing animals for no reason is a primitive act of violence, hunters call killing from an ambush or persecuting innocent animals a sport. 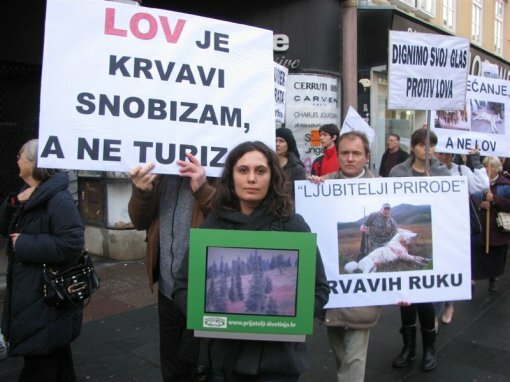 Massacre and barbaric ways of "entertainment" are promoted as part of Croatian tourist offer, although sadistic treatment of other beings downgrades Croatian tourism, which should focus on beauty and preservation of nature. Spilling blood under the slogan of pretended caring for environment and animals is morally perverse and ecologically unacceptable. 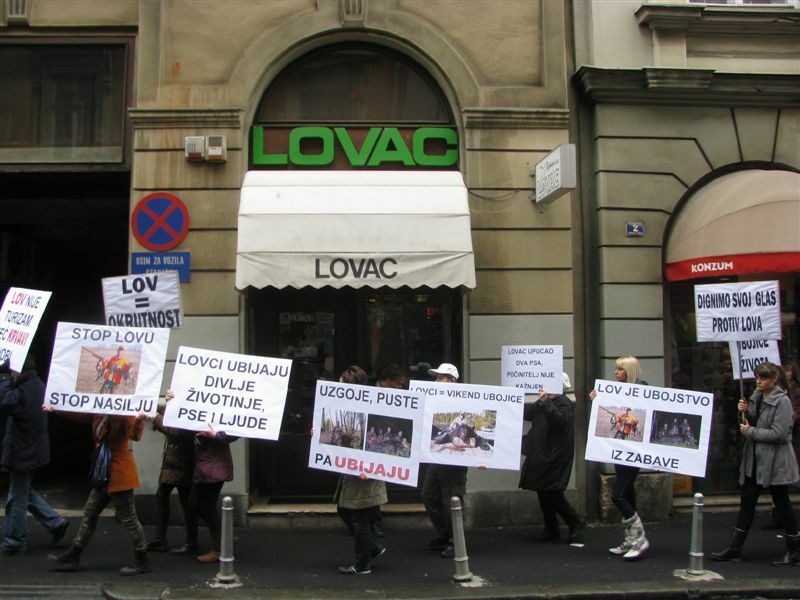 Organizations Voice of Animals and Animal Friends invite citizens to direct attention to wanton killing of animals by a protest march on Saturday, December 3, 2011. 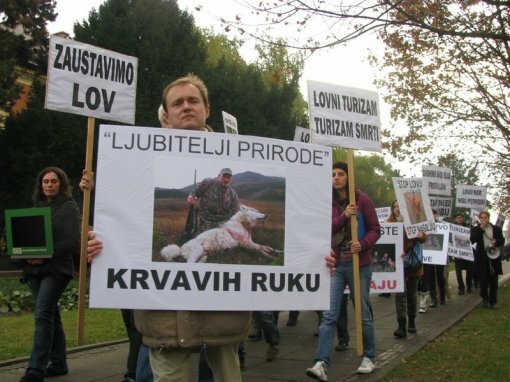 The protest starts at 11 A.M. from Trg kralja Tomislava toward Trg bana Jelacica, where a powerful performance of collecting living trophies will take place. With her presence, Croatian Miss Sports, Kristina Vilk, the face of "Hunt Results, Not Animals" campaign, will support the protest. 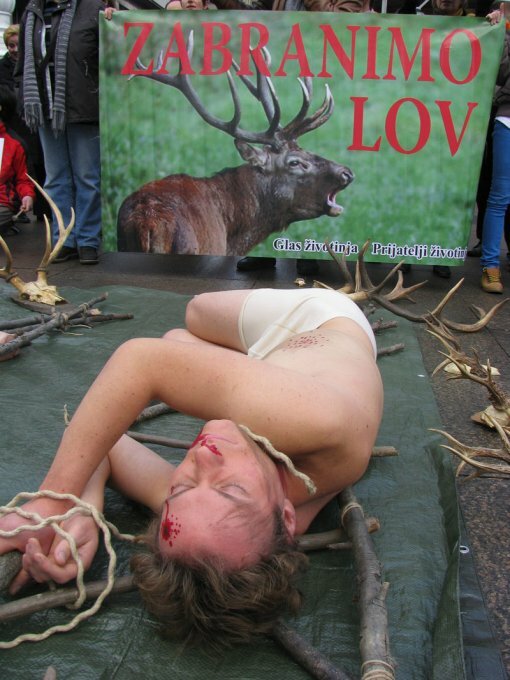 Hunters call a sport persecuting, wounding and killing animals to satisfy their needs for violence, which aims to alleviate and cover up for the fact that it is murder. "Killing off" aims to demonstrate their superiority over animals who do not have the chance to defend themselves and save their lives. Therefore honoring killed animals is a perverse act of covering up brutality. "Thanks" to hunters several species in Croatia, like the bear, wolf and griffon vulture, have been brought to the edge of extinction. Also, hunters consciously create problems by intentional breeding animals in certain areas, which is later solved by new slaughter or breeding animals on breeding sites to later release them into the wild and kill them or, with financial compensation, leave it the murder up to foreign citizens. Croatian hunters own around 100,000 pieces of hunting weapons, and every year they go out several times on their bloody campaign, which sometimes cause people to get hurt as well. Often they act like "local sheriffs," illegally intentionally killing dogs and cats and intimidate people, who, out of fear of the hunters, dare not go for a walk in the forest with their children and dogs. 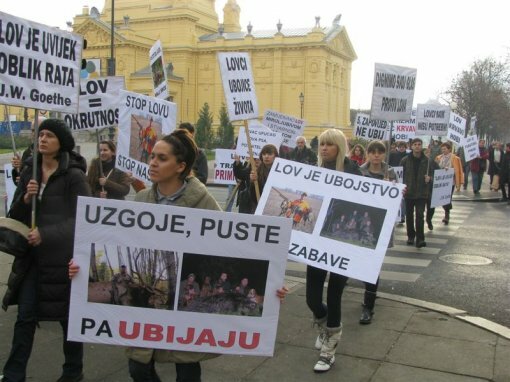 Animal Friends condemns "killing off" of animals and ask that Croatia show its civility and stop promoting hunting as part of tourist offer. Tourism should not promote killing and violence in any of its parts. Protecting environment and approaching animals, who will not hang from walls as trophies but rather live their lives, can be implemented successfully by developing eco-tourism, where animals are "hunted" by cameras, and not weapons. There is great potential in eco-tourism - new jobs, income from foreign and domestic tourists, but also learning about nature. Hunting should be extinct, and replaced by peaceful and actual protection of animals and nature.